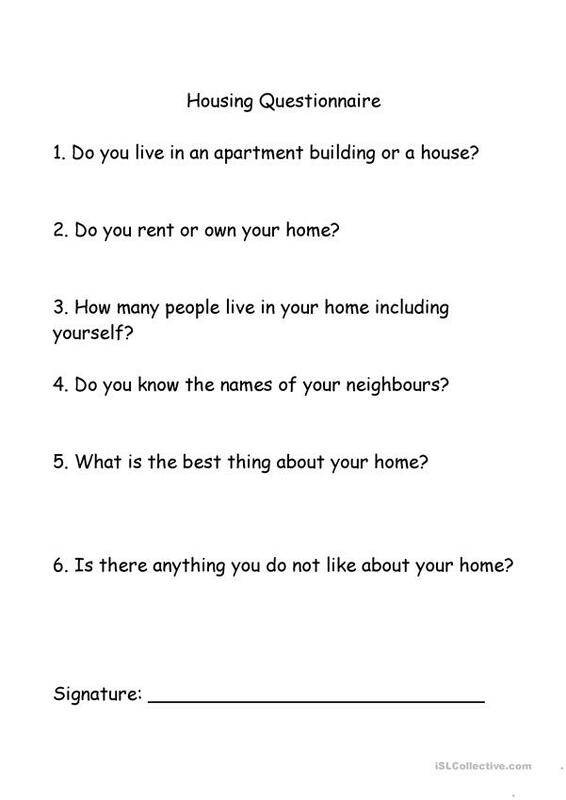 Questions about housing to answer anonymously. Then redistribute the papers and have students walk around asking each other the questions. When they find the person whose questionnaire they are holding, they ask for their signature. They can then take turns presenting their partner's answers to the class. The above downloadable handout is best suited for adults at Elementary (A1) level. It is a useful material for consolidating Questions in English, and can be used for developing your students' Listening, Speaking and Writing skills. It features the topic and words of Home. karenloeb is from/lives in Canada and has been a member of iSLCollective since 2011-12-18 22:26:52. karenloeb last logged in on 2016-03-30 20:12:54, and has shared 1 resources on iSLCollective so far.